It had been hoped that the SS United States could be converted into a modern luxury cruise ship. Efforts to preserve it will continue. The SS United States won't sail again. Earlier this year, a luxury cruise operator and the nonprofit that owns the long-retired ocean liner docked in South Philadelphia announced an effort to return the aged ship to its former life as a glamorous ocean liner. Can the SS United States again sail the seas? 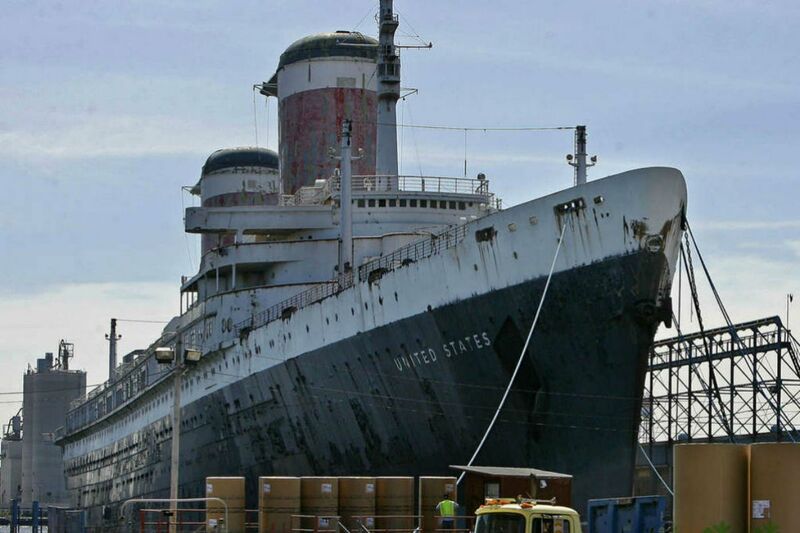 But after a feasibility study, Crystal Cruises and the SS United States Conservancy have determined that refurbishing the ship to sail would be too challenging, the groups announced Friday. "Unfortunately, the hurdles that would face us when trying to bring a 65-year-old vessel up to modern safety, design, and international regulatory compliance have proven just too great to clear in both a technically and commercially responsible manner," Crystal president and CEO Edie Rodriguez said in a statement. Crystal, which signed an option agreement with the conservancy in February, will donate $350,000 to the conservancy, which plans to resume its efforts to preserve the vessel. The cruise operator also spent about $1 million on the feasibility study. The organizations had hoped to convert the ship - which was built in the 1950s, became the world's fastest ocean liner, and ferried Princess Grace of Monaco, Marilyn Monroe, Bob Hope, and other celebrities - into a modern luxury cruise ship. The evaluation by maritime experts and engineers concluded that the ship was structurally sound but modifying it for such service would require changes to the hull that would create stability problems. Installing a modern diesel electric propulsion plant also would have required shaft lines to be altered and about 25 percent of the hull to be rebuilt. Susan Gibbs, the Washington-based group's executive director, said in a statement that the vessel continues "to hold enormous potential as a stationary mixed-use development and museum in New York or another urban waterfront setting." When plans to restore the ship as a modern ocean liner were announced, officials suggested the vessel would be based in New York, but no timeline to move it from Philadelphia has been established. The ship was taken out of service in 1969. It was towed to Philadelphia in 1996, and the rusting vessel has been docked on Pier 82 of the Delaware River since that December. Over the years, various other plans were proposed to restore the SS United States and return it to the seas, but all ultimately failed. It has nearly ended up in the scrapyard several times. In 2010, philanthropist H.F. "Gerry" Lenfest donated millions to help the conservancy buy the ship from Norwegian Cruise Line, which had begun accepting bids from scrappers after an effort to sell the vessel was unsuccessful. And last year, the conservancy raised $600,000 just in time to avert a save-it-or-scrap-it deadline and prevent the ship from being junked.